Calling all Padawans! Your training is about to begin at the Party with the Force Jedi Academy. While most Padawans train with their masters for about a decade, our masters will train you in several hours. 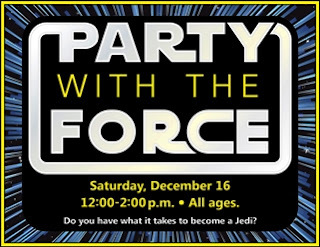 Come and test your Jedi skills on Saturday, December 16th from 12-2 PM. You can create some Star Wars art along with eating a snack to keep up your Jedi strength. We highly ENCOURAGE you to wear your Star Wars gear. You will definitely see our masters in Star Wars attire. Here's a bit of Star Wars movie history. The first Star Wars movie was released in the United States on May 25, 1977 (it's title was later changed to Star Wars IV: A New Hope). It was the highest-grossing film of all time until 1982 when E.T. the Extra-Terrestrial was released. The original film was nominated for ten Academy Awards (it won 7) including Best Picture which happened to be won that year by the movie Rocky. Star Wars is regarded as one of the most important films in the history of motion pictures. The film's success led to two successful sequels, The Empire Strikes Back (1980) and Return of the Jedi (1983). Star Wars was reissued numerous times as requested by George Lucas, to include modified computer-generated effects, altered dialogue, re-edited shots, remixed soundtracks, along with added scenes. A prequel trilogy was released in 1999, beginning with The Phantom Menace, then Attack of the Clones (2002), and Revenge of the Sith (2005). In 2015, the sequel trilogy began with The Force Awakens. And now we are just days away from The Last Jedi (December 15th). "Use the force, Luke" and find your way to the Roselle Public Library on December 16th!